Bacon - check. Pasta - check. Chicken - check. Perfect meal right here! It's like banana pudding and dirt pudding combined! I've had a few recipes that use prepared pancake mix and I would love to use a homemade recipe rather than a boxed mix. Coffee cake muffins - I didn't know such a thing existed! I actually hate hamburger helper, but I think homemade HH would be good because it doesn't use that dreadful fake powdered flavoring mix crap. The perfect breakfast for my husband! This looks super good and my kids love cinnamon rolls, but are still sketchy on oatmeal. I'm pretty sure everything is good when wrapped in bacon! Scientific fact! Mango and pineapple are both incredible and in my top 5 favorite fruit. I'm sure in addition to being the stickiest buns ever - these are probably the best sticky buns ever! I thought these would be perfect for a baby or bridal shower. They are cute and versatile! I was eyeing this for my husband's birthday. It'd be perfect. 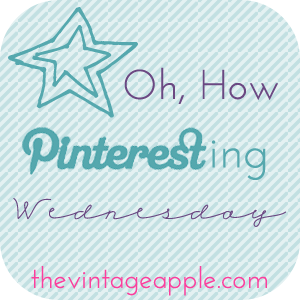 This was linked up to my Tasty Thursday party and I couldn't help but share them! Another chicken dish served over pasta that you make in the crockpot! I love jalapeno popper grilled cheese, but this method blew my mind! Our host, Tina, posted these super yummy mozz grilled cheese! Steakhouse tips for the best steak ever. Freeze tubes of cookie dough and slice to bake! What to refrigerate, what not to refrigerate. As always, another great list! You have so many great finds here!